Supernatural aired its midseason finale last week, and "Citizen Fang" gave us a lot to talk about. Where does our Round Table panel stand? Find out now, as Carissa Pavlica, Carla Day and Sean McKenna - along with Alice Jester from The Winchester Family Business - break down the episode in detail. Read their take on various topics and weigh in with your views in the comments! 1. Was this a good mid-season finale? Carissa: I thought it was great. Instead of there being some big bad looming, it was the brothers' relationship that was suffering and left hanging in the balance. I'm always happiest when they are the core of any plot. Carla: It worked. At first, I was disappointed we weren't going into the hiatus with a mythology driven story about the tablets, but this was better. Instead we got an episode that went to the heart of the show - the Winchester brothers. They have struggled since being reunited and this conflict was coming. Sam's use of Benny against Dean and then Dean's manipulation of Sam with Amelia showed these new soft spots created by love in each of the brothers. Alice: Yes, I think it was the best episode of the season so far. It wasn’t predictable and I was on the edge of my seat the whole hour. I was really stunned by the end. I know Sam and Dean have been at odds, and Sam did ask for trouble with his threats to kill Benny by teaming up with Martin, but man Dean sending that text was just harsh. I know he did it to protect both Benny and Sam, but it was still harsh. Sean: I feel like we haven't had a lot of time focused on the mythology-heavy story arc for the season and I was hoping we'd get to see more of that. However, I really did like that the brothers were front and center. Not only that, but Sam and Dean were forced to deal with what happened during their time off. This was a very Sam and Dean as characters episode. 2. What did you think of the return of crazy Martin? Carissa: I was ashamed of Sam for offering him an olive branch that he wouldn't even offer his own brother. 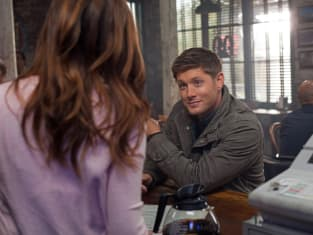 There was obviously some background noise in bringing him in to spy on Benny without telling Dean, and I'm sick of both Sam and Dean for not just sitting down and talking this out. Bobby would have called them ijits, thrust a beer in their hands and made them work it out. Carla: Odd choice for Sam given the assignment. Though, Sam didn't have many options since he wanted to keep it a secret from Dean. Martin's involvement added a layer of complexity and uncertainty. Alice: I wasn’t sure about the return of Martin, but I do like how he went off the deep end. Kind of explains why he was in the nuthouse, huh? Willing to risk an innocent girl’s life just to kill a vampire? Maybe easing back by driving an ice cream truck would have been better. He would have ended up less dead. Sean: He was off his rocker for sure. I wanted to root for him but as soon as he kidnapped the girl, I knew he had to go. You just can't do that. I did like that he was a figure from their past, even if it was short lived. 3. Will Benny receive any consequences for killing Martin? Carissa: He better not. Why should he? Martin was, no surprise here, crazy! He was thirsting for blood, any blood, after years of being locked away. Sam should have guessed that as soon as they all talked. Martin was holding a civilian hostage, a knife to her neck. Even Sam or Dean would have taken him out. Benny was in the right. Carla: Not in the Hunter or Vampire world, I don't think. In his personal life, it will have enormous repercussions. He will have to leave his hometown and family behind. That's unfortunate and sad. Alice: Benny seems to be receiving consequences for just breathing! He can’t catch a break. He’s already suffering those consequences by saying goodbye to his only connection in this world and going deep underground. That doesn’t sound like much of a life. That’s probably worse than any hunter coming after him. Sean: Probably, although he was simply saving an innocent person's life. Benny just wants to live a humble and quiet life, but I guess being a vampire means that's never going to happen. I feel like this poor guy keeps getting backed into a corner over and over. Give him a break, world! 4. What will it take for Dean and Sam to get back on good terms? Carissa: Bobby coming back to life and shoving a beer in their hands? Or...his ghostly presence appearing to do the same? They're too stubborn to figure this out on their own. Carla: They need to stop punishing each other for the perceived wrongs. Either they will recognize the harm their actions caused both of them and the others around them and really talk OR it will have to come down to a life and death battle over the tablets. I hope the former, but expect the later to be what happens. Alice: That’s a stumper. I really don’t know. They’ve been talking, but they haven’t been listening. They’re so far apart right now and it’s all because they won’t (or can’t) see each other’s point of view. They’re together for the sake of the job, but now they’re even at odds with each other on how to do that. It’s gotten to the point where they’re hurting each other and don’t know how to stop. Usually that’s when it’s time to call it quits. Sean: The most delicious slice of pie. They really need to recognize each other as people and as brothers. They are so focused on the wrongs done and the job at hand that they become collateral damage for themselves. Sam and Dean have got to realize that they've made mistakes and get past it for the both their sake, as well as the sake of the world. 5. What does Amelia's return mean for Sam? Carissa: She's either going to say 'thank you for giving Don and me the opportunity to get to know each other again' or 'you're an idiot for leaving and I've made the best of it.' I'm guessing there is a third option like, 'and now I'm pregnant,' or 'please stay.' Essentially - skys the limit here! Carla: I hope he gets closure. That she lets him go and he is able to move on. That's what's needed for Sam to heal his relationship with Dean. I don't see any path to a healthy relationship with her any longer that doesn't end up causing Amelia great pain or even harm. Alice: It’ll probably open a bunch of old wounds and he’ll be crushed to pieces by the end of it. Or perhaps he’ll realize he did the right thing about leaving and go back to Dean with a clear conscience. Or maybe a monster will eat her. That would at least keep Sam’s track record with lovers intact! It could go anywhere. Sean: Another Supernatural wedding? I kid, I kid. I feel like bringing her back is going to open her up to the monster world, but I'm not sure where there relationship will go from here. I just can't see it lasting beyond this season if they do try and continue it. 6. Anything you'd like to see when the show comes back in January? Carissa: Sam and Dean find out John Winchester might be haunting a nudist colony and they have to go undercover to investigate. Don't judge me. You asked! Carla: Hunting. They are hunting and should be out there fighting the evils of the world. And, definitely more about Kevin and the tablets. That mythology hasn't been as well developed as I would like to see. Alice: I’m hoping they’ll pick up the pace a bit. Season eight so far has been good and I’m happy that the writing has been more consistent, but it’s been moving a bit slow. I’d like to see some more action and mythology reveals, especially with Castiel. Plus I’m dying to see how they plan on getting Sam and Dean past their current drama. Sean: I've been enjoying the season so far, but I really want them to pick back up with the mythology. And not every five episodes or so. I know they have to get through their problems with each other first, but putting Sam and Dean back on that determined track together will really get the show moving again. Hopefully, the brothers can get back to joking with each other and having a good time. Let's have another prank war!